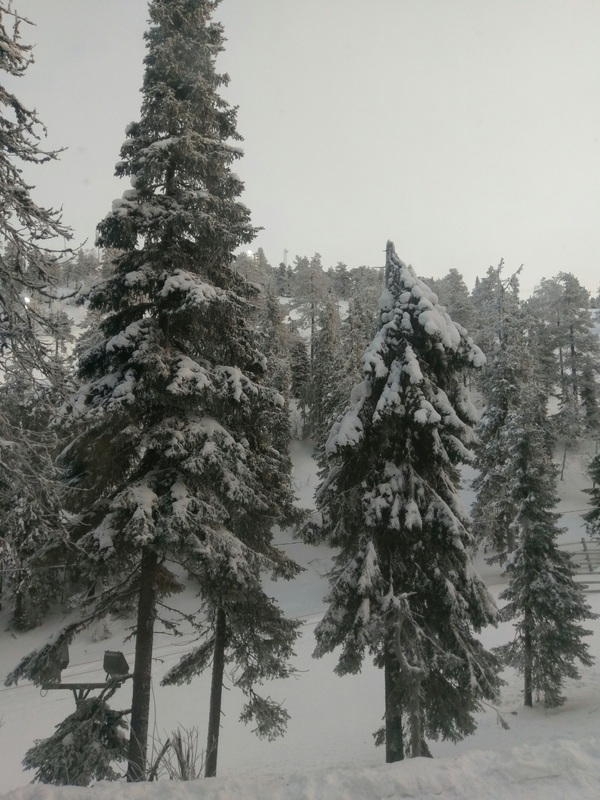 Imagine being inside a snow globe, the snow swirling round you and sparkling like glitter in the twilight. Imagine endless trees, heavy with snow. Beautiful sunrises and amazing sunsets with pastel coloured skies in between. Imagine the excitement of stepping outside of your apartment door and zooming straight down a hill on a sledge and an endless snowy playground where you can build, slide and play to your hearts content. Imagine zooming along at 20 miles an hour on a husky sled or the peacefulness of being pulled through the forest by a reindeer. Welcome to Finnish Lapland in winter, where every day is like a dream! 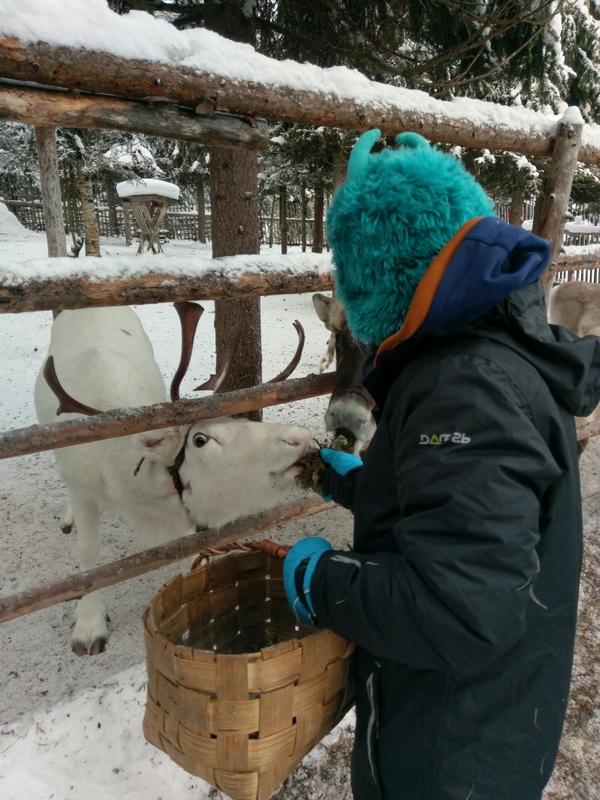 Having done a weekend organised trip to Lapland last year, we fell in love with the place so this time we decided to go for longer. 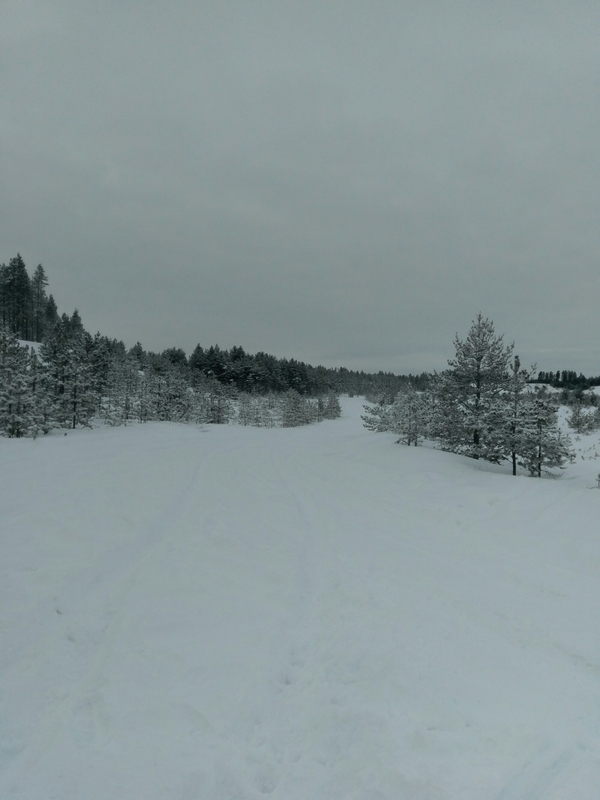 Our budget was a lot lower this year so I spent a few weeks looking at all the options before opting to travel with Crystal Ski to Ruka, Kuusamo. This was definitely the cheapest option. We contacted a local travel agent, Matthew Ruth, who managed to knock a bit more off for us. We had accomodation arranged by Crystal Ski in an apartment at the Rukahovi Rantasipi hotel in the ski resort of Ruka. We opted out of the arranged coach transfer to our accomodation and instead booked a car from the airport. We did this as we had decided to book a lot of activities independantly and needed our own transport. 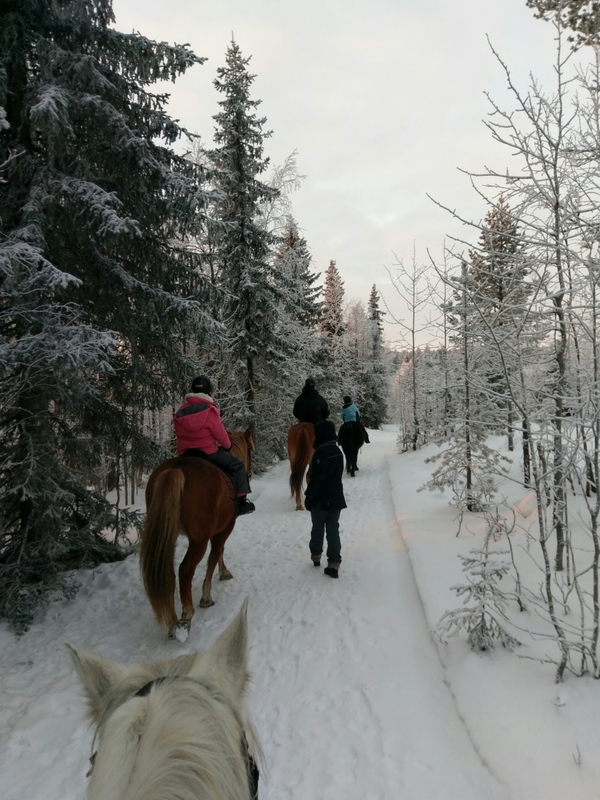 Day 2- Horse Riding through the snowy forest. Day 5 – Going to find Father Christmas! This was all mixed up with sledging, sledging and more sledging! Lapland, at this time of year is cold!! The temperature varied while we were there from -6 to -34 on some days. Sunrise was around 10.30am and sunset around 2.45pm. It is cold! I would consider waiting until your children are at least four or five before travelling here. We were not too cold as we were well prepared. The trick is to layer, layer, layer! It took me an extra hour every morning to get the two younger children ready! On days when it was -34 we were wearing: thermal underwear (long sleeved thermal vests and long johns), 2 thin fleece layers, 2 extra pairs of jogging bottoms, 3 thick fleece layers, ski suits, glove liners, ski gloves, normal socks, 2 pairs of ski socks, snow boots, neck warmers, hats, hoods and face masks. The best thing we took with us were boxes of disposable hand and foot warmers. On days that were slightly warmer we needed less layers. Wool and fleece are the materials to go for and good quality snow boots! A tip for getting all these layers on a budget is to try and find ski suits second hand. They are often used for one trip and then sold on. 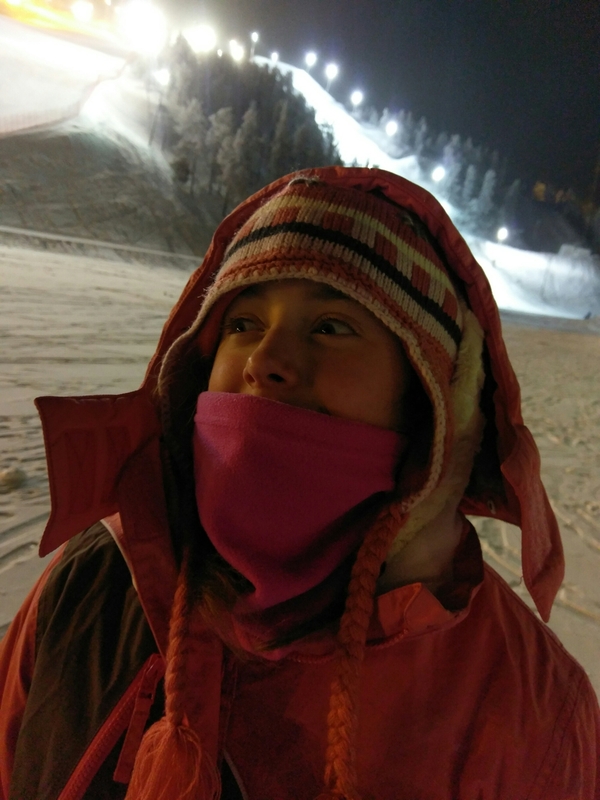 Make sure you buy ski suits that are too big to fit on top of everything else and snow boots need to be big too as your feet will be warmer if there is space in the boots – tight boots and socks mean very cold toes! Sometimes wearing less socks is warmer than more. If your feet do get too cold then the best thing you can do is take your boots off (inside of course) as they will warm up quicker this way. Take food! We ate one meal out and it cost us €135 for two adults and three children! As it is Europe you are able to pack some food in the hold and taking breakfast cereals saved us a lot of money. 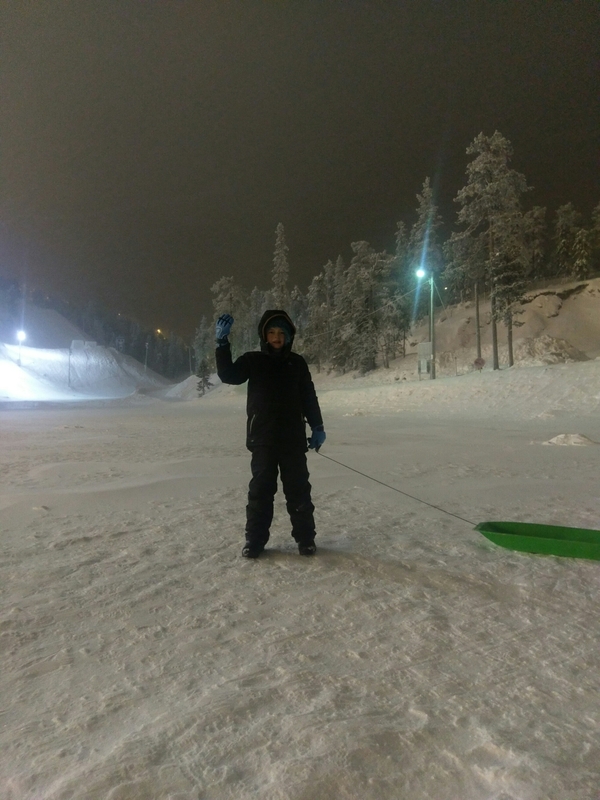 There are small supermarkets in the resort of Ruka but they have limited stock and I was told by a local that the prices are at least 30% more than in the large supermarkets in Kuusamo, so if you have a car it is worth driving the extra distance to stock up on food. I would also suggest staying in an apartment so you have the freedom of making your own food. The hotels do offer half board for a large price and also one off meals.The local drink of Glog (spiced juice served hot) is worth getting and drinking to warm up from the inside. Buy sledges! These are around €10 each in any local supermarket and well worth it for the amount of entertainment they provide! Pack your phone amongst hand warmers when outside and only take it out briefly to take photos. The cold will literally drain the battery -mine went from 95% to 1% in five minutes! Dont worry about packing nice clothes,shoes,or wearing make up. When eating out etc, everyone goes in ski suits and layers, and make up freezes in the cold! If you can, hire a car! This saves a lot of money as taxis are expensive. It also gives you freedom to explore and try different activities aswell as travelling out of town to the bigger supermarkets. However, driving in snow can be difficult! We got stuck three times, the first when we followed our sat nav out of the airport which sent us down a road that hadnt been cleared. We needed towing out. The second when we took a wrong turn onto a road that hadnt been cleared. This time we managed to push the car out. The third time we drove too close to the edge of the road and ended up in a ditch. Some very friendly locals arranged a tow truck for us and took us to their house to warm up while we waited. 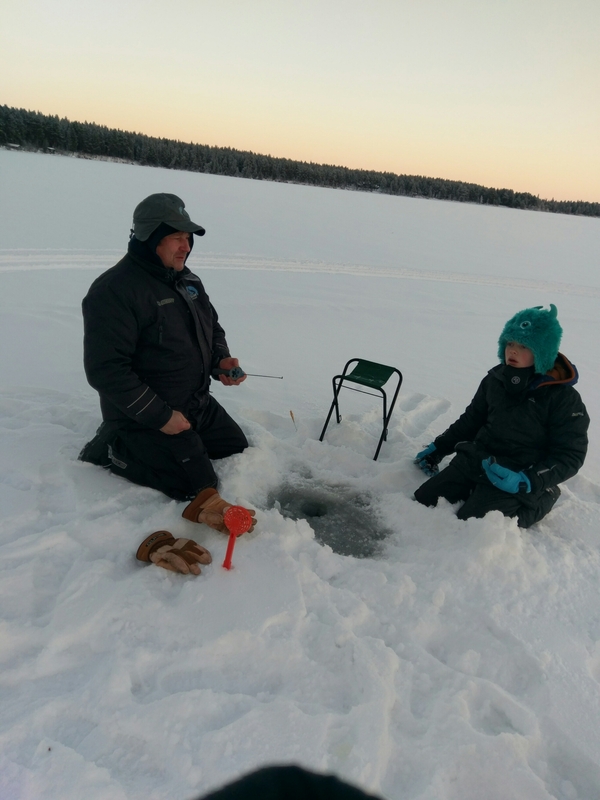 Through this we found out that the people in the North of Finland are extremely friendly, hospitable and helpful! The kids loved the adventure of it all. If a road looks like this then dont drive down it! 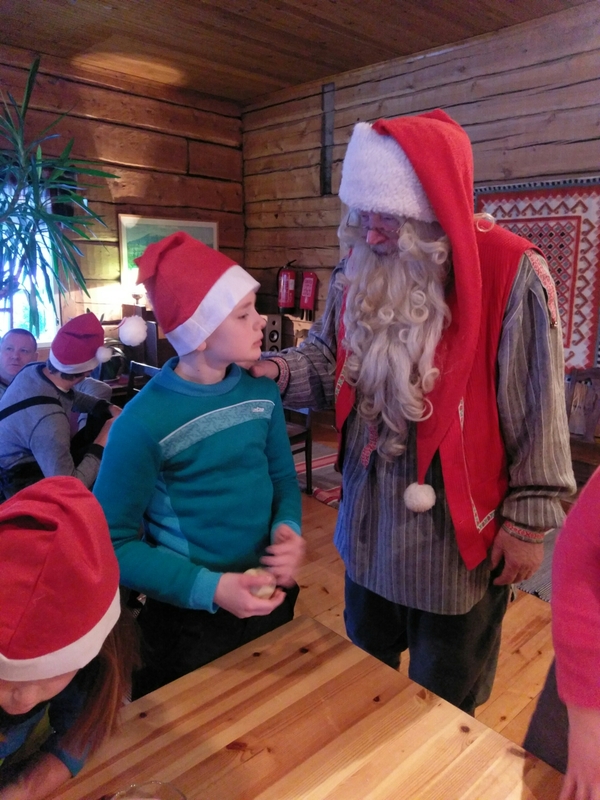 Lapland with an autistic child? He loved it! He wants to live there! The snow is great, he loves the cold and everywhere we went he was holding a big block of ice he had found! He struggled a bit with putting on so many clothes and a lot of patience was needed when these layers were thrown off occasionally to reach an itch but, once it was all on, the snow was generally enough of a distraction to forget about it. We had to spend a while in England trying on hats until we found one that wasnt annoying. There are a lot of activities involving animals and this was calming for him. The only activity he struggled more with was the Father Christmas trip. This is probably because the other activities we organised were private trips, where as there were more people at Father Christmas’ house. He loved throwing himself down hills and playing in the snow and all in all had a great time!